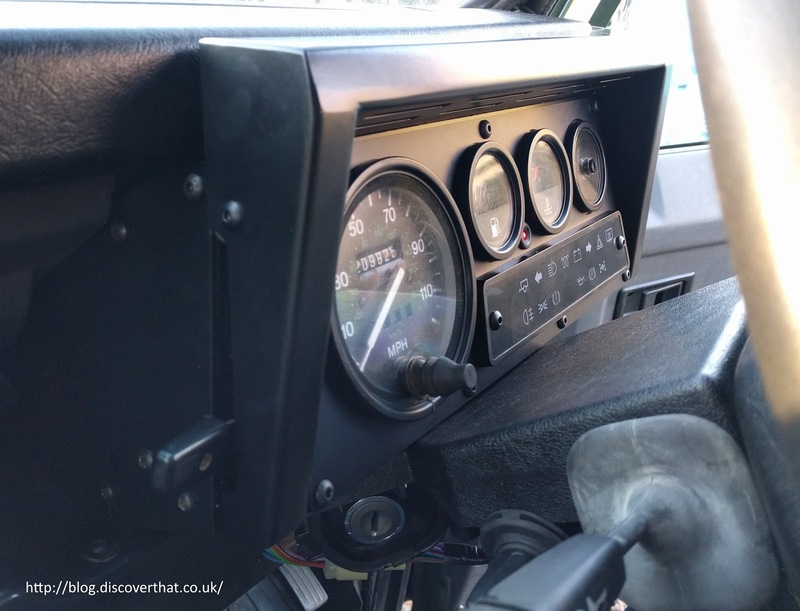 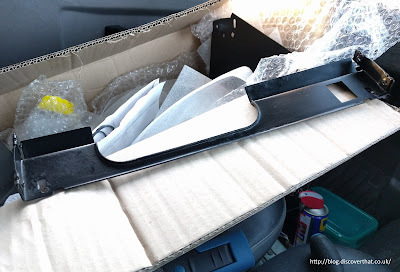 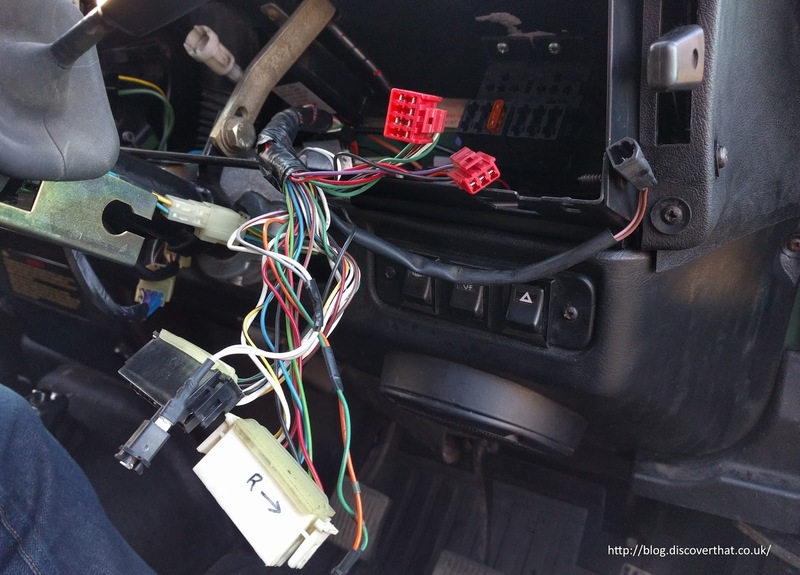 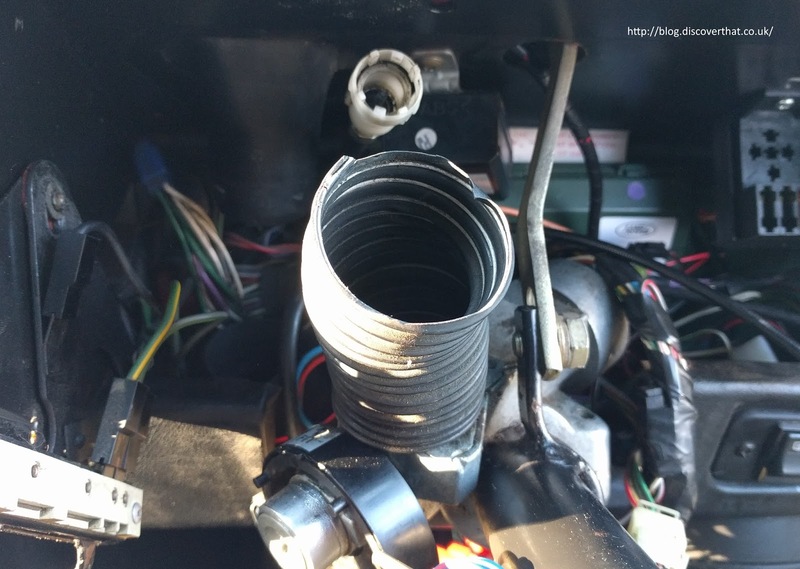 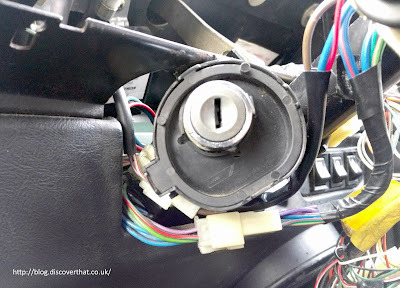 The plastic round the instrument cluster in Fender was held together with metal straps and badly fitting self tapping screws. 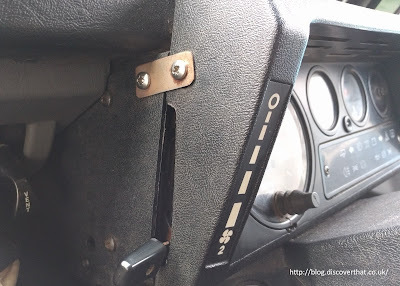 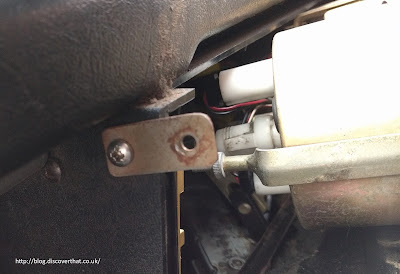 The rough repairs to the dashboard were because the plastic of the binnacle had broken round the fixing tabs. 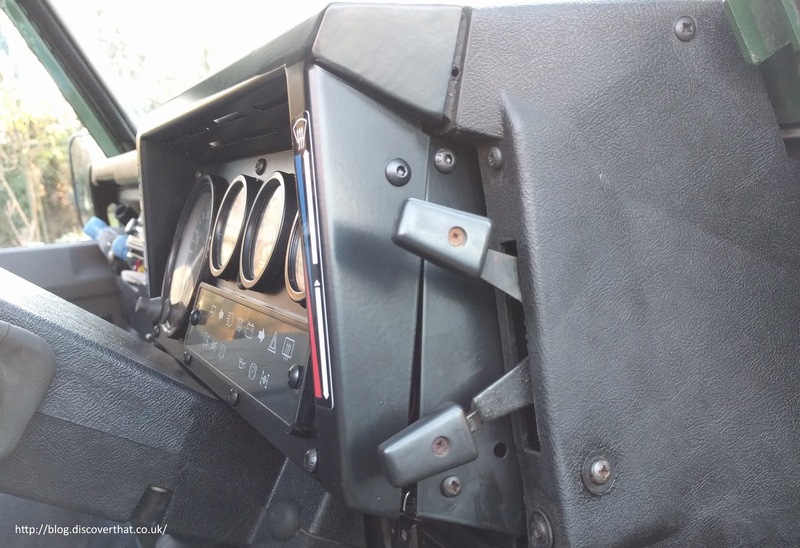 Apparently this is common and Raptor Engineering make a metal replacement. 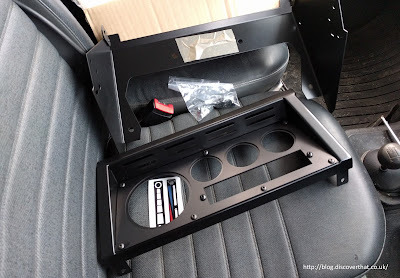 They also make a back bracket to replace the plastic one, also broken on our Defender. 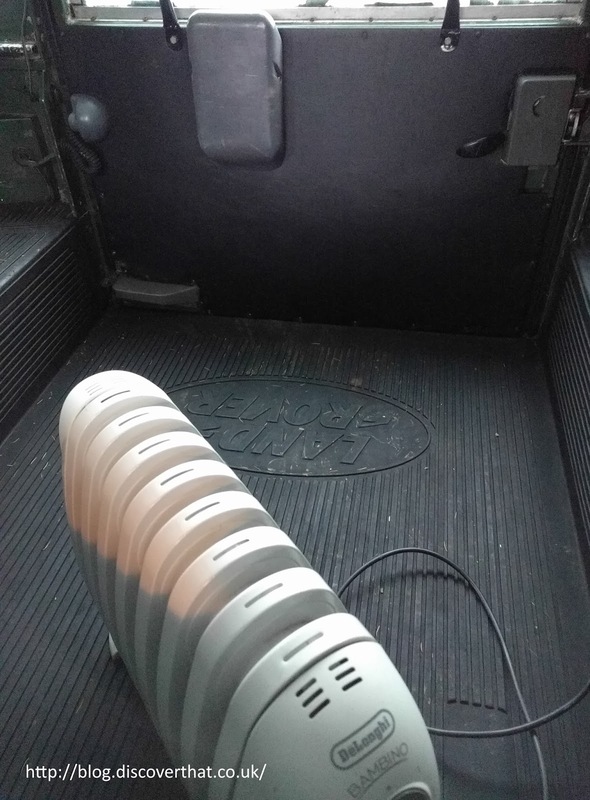 It's winter and cold outside so I added some heating to make working on Fender more comfortable. 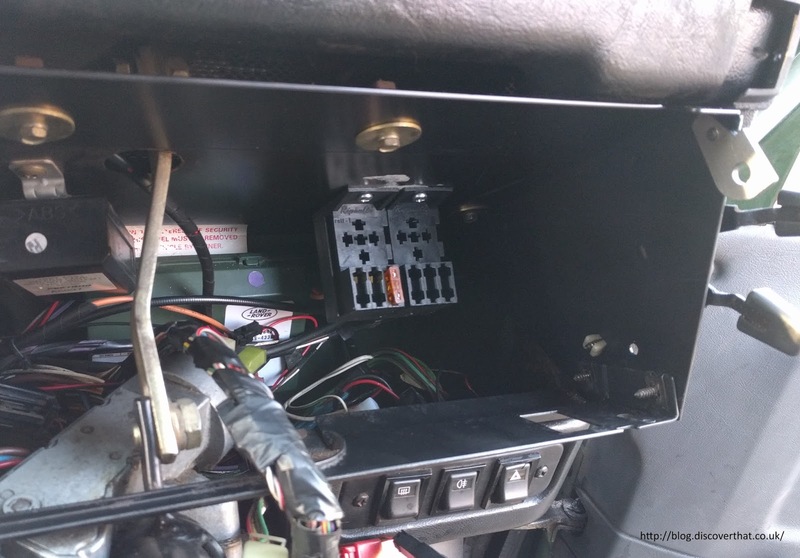 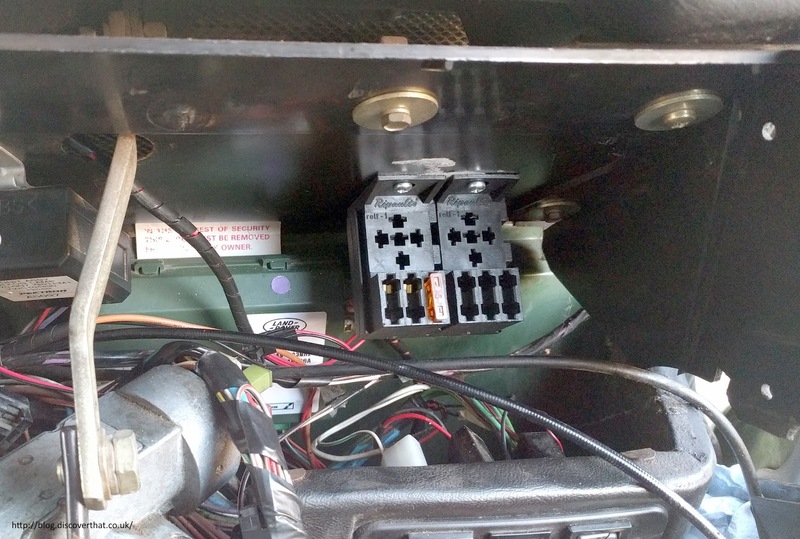 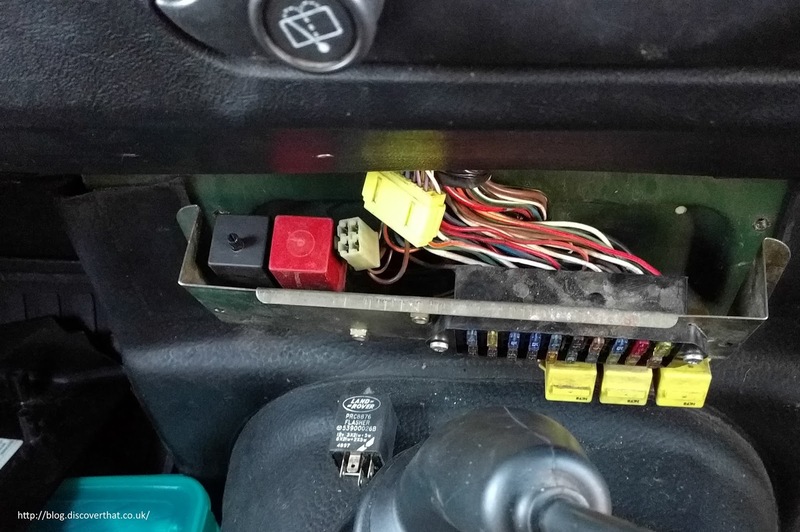 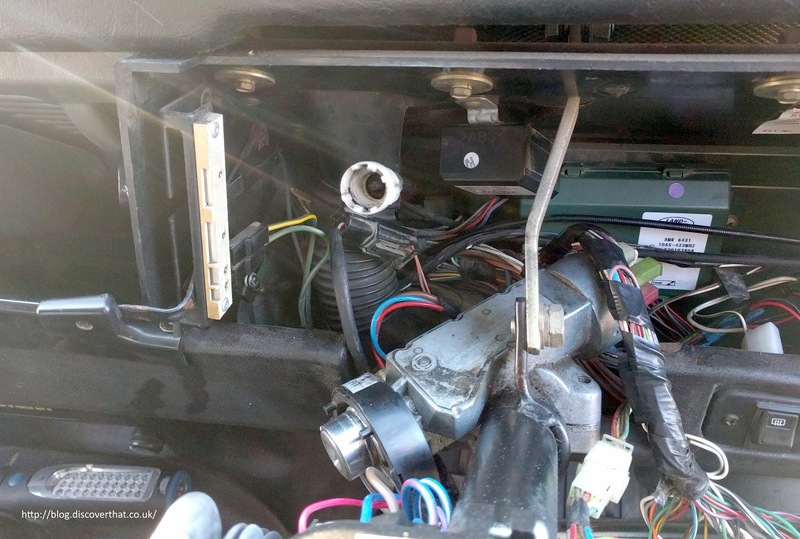 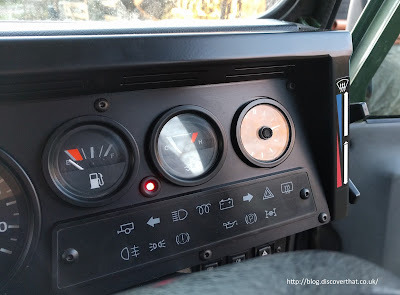 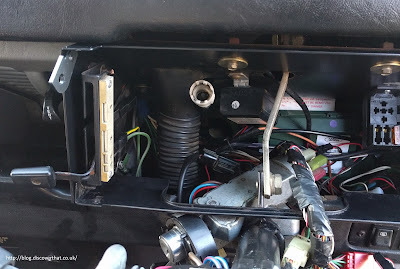 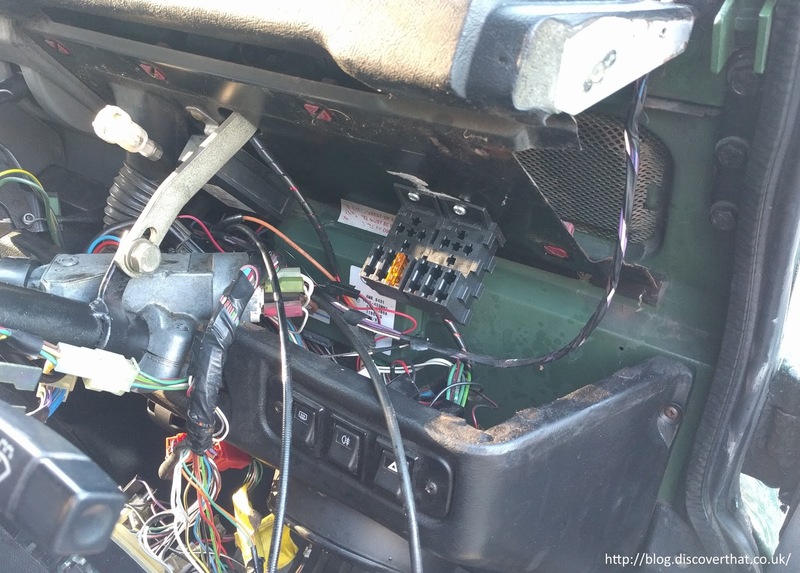 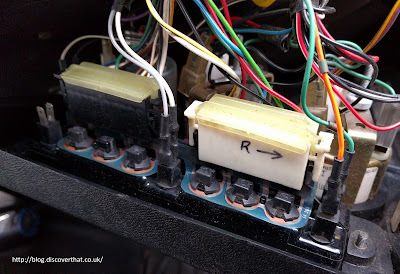 The first job I did while it was all apart was to fit an auxiliary fuse box. 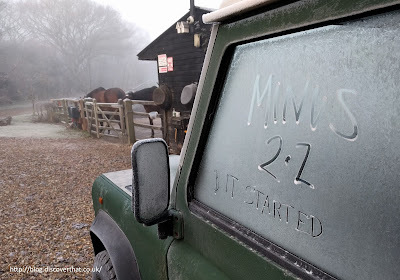 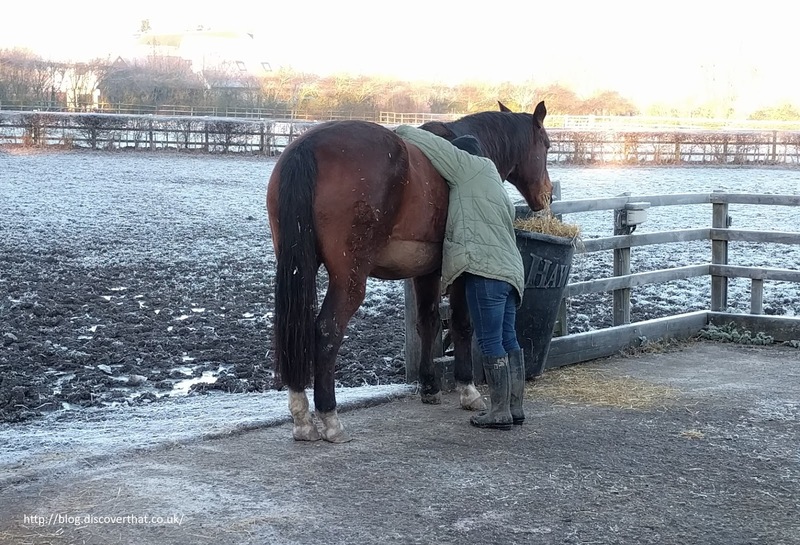 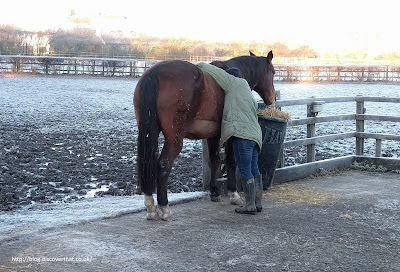 With hindsight I would have had more room to work if I had done that last! 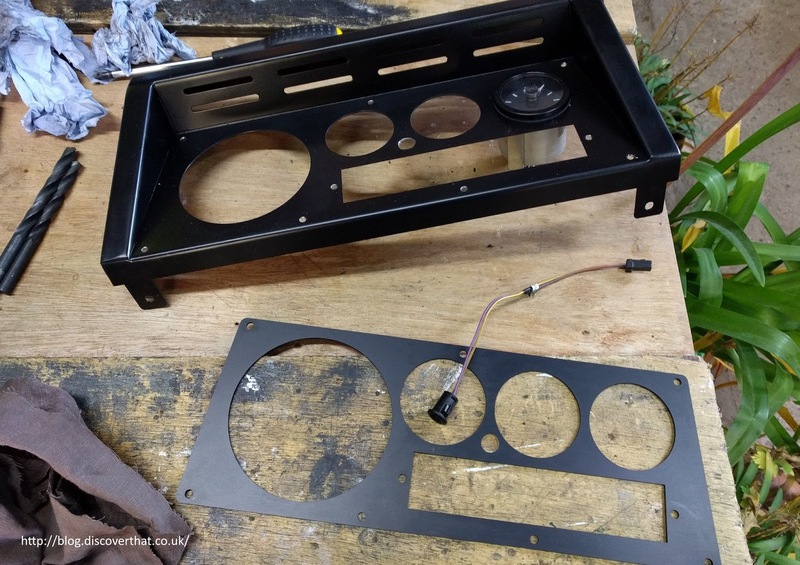 Replacing the binnacle is a fairly easy job but a little time consuming because of all the bits that need to be removed and swapped over. 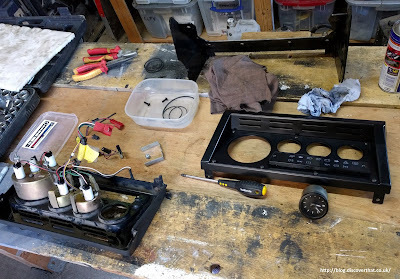 I also took the opportunity to clean and repair other bits before putting it all back together. 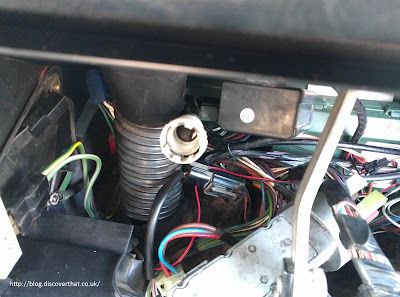 The speedo cable drive is always awkward to remove but that is just one of my dislikes. 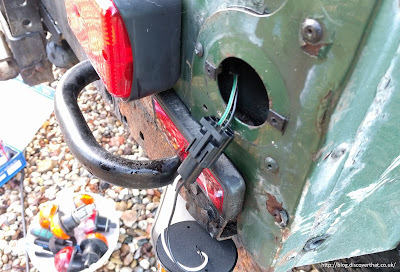 I usually get the squeeze and pull to work after a few attempts. 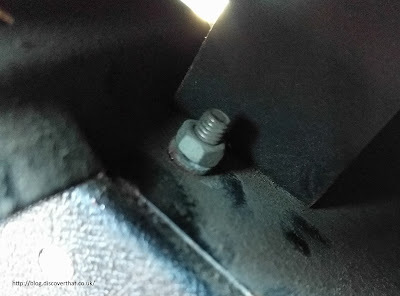 One of the screws towards the back of the of the mounting bracket was difficult to get to. Removing the short section of corrugated heater pipe gave a bit more room to move the ratchet handle. 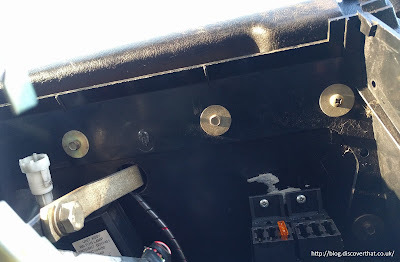 One of the fixings is a bolt and you get to the nut after removing the right hand heater controls. Shelley cleaned up the rust and sprayed the existing metal lower plate to make that look better. She also replaced all the exterior lights with LED lamps while I worked on the dashboard. 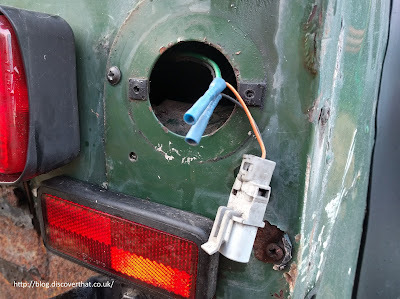 Typical of work on Fender so far, someone had done a hasty work round making our jobs more difficult. One of the lamps had been replaced with the wrong type. 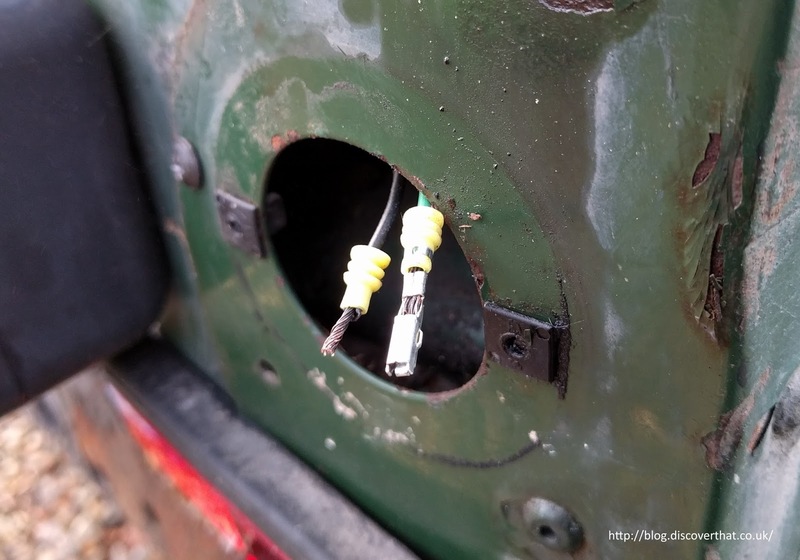 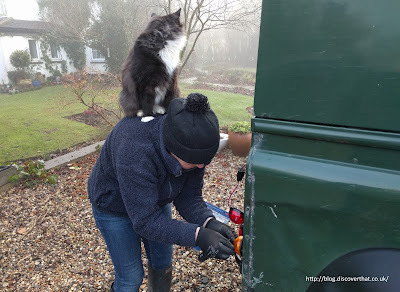 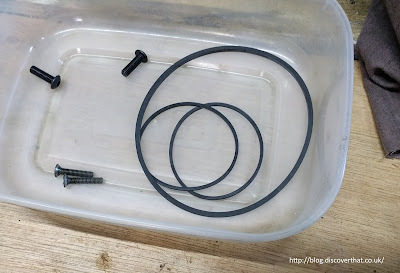 Luckily I have the correct Econoseal connectors in my shed and fitted one to the original leads. 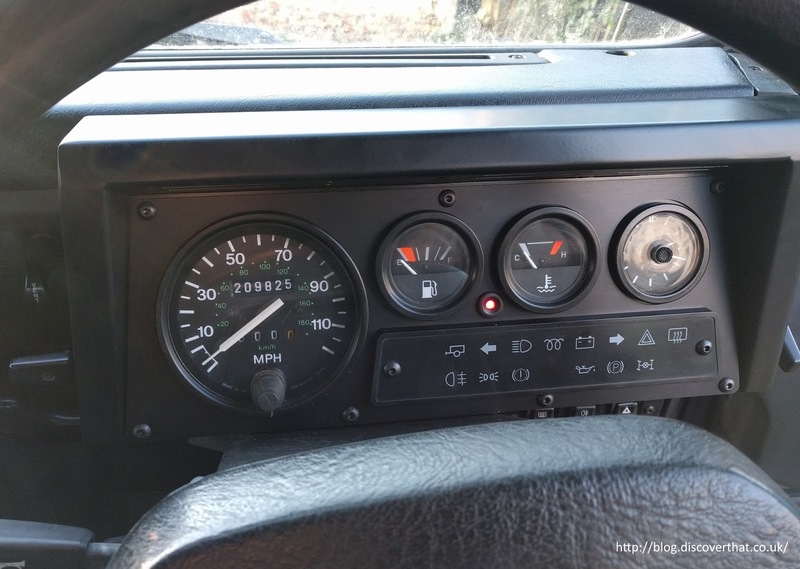 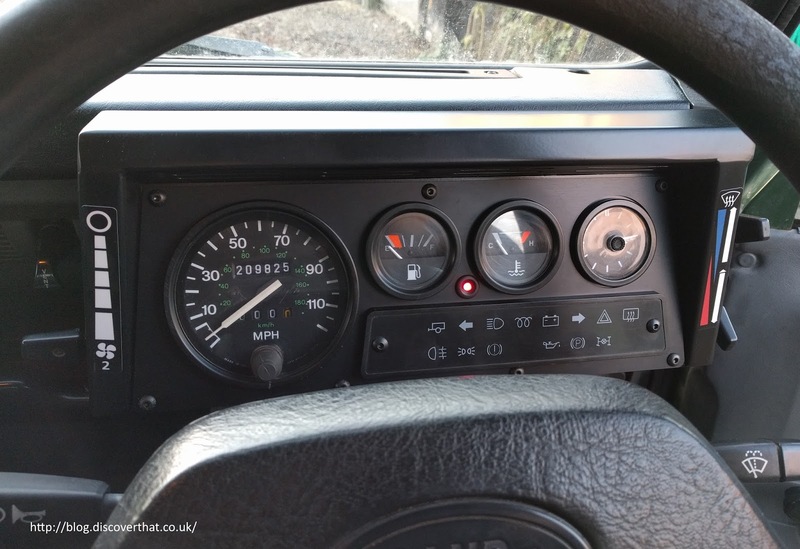 LED indicators need a different flasher relay to get them to work at the correct speed. Another distraction while fitting the binnacle was the steering column. 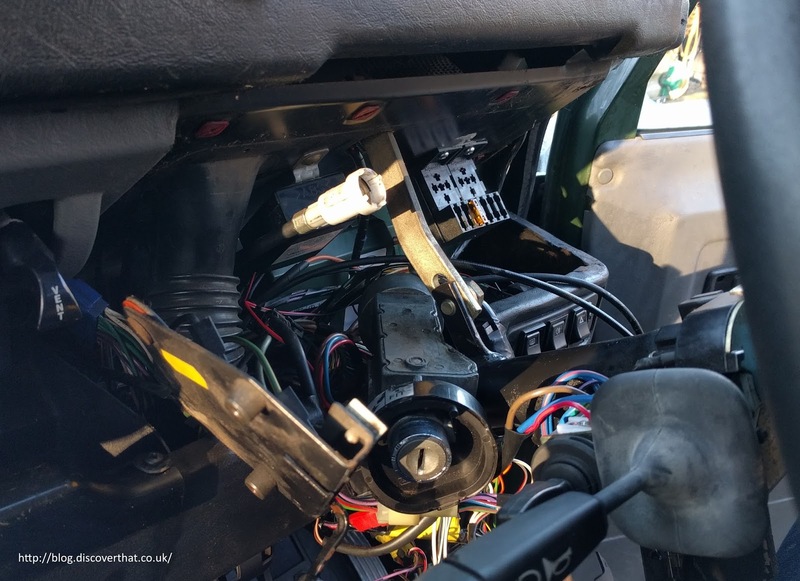 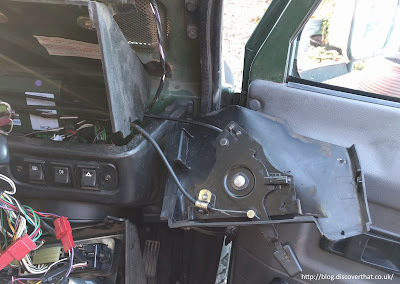 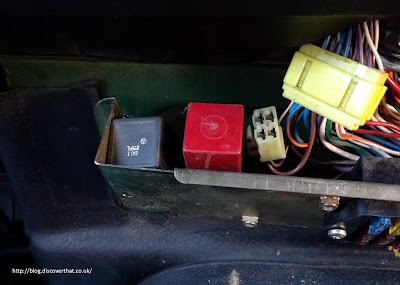 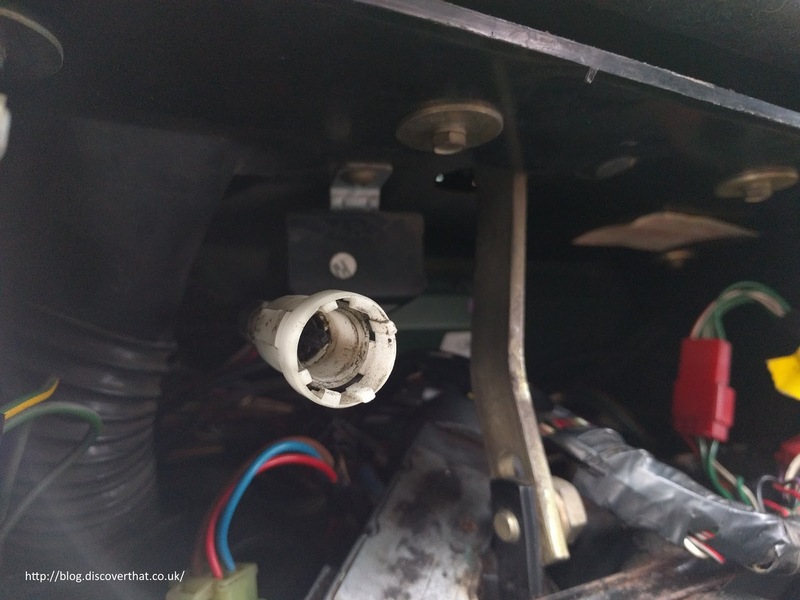 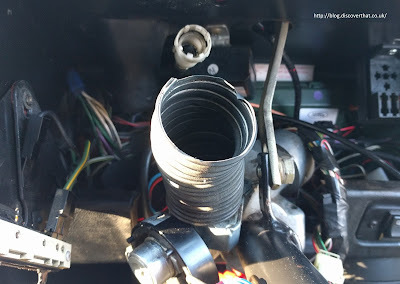 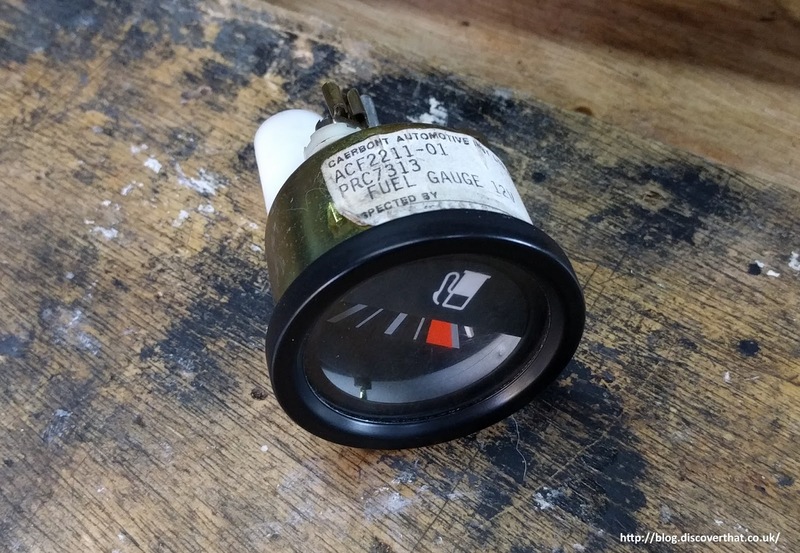 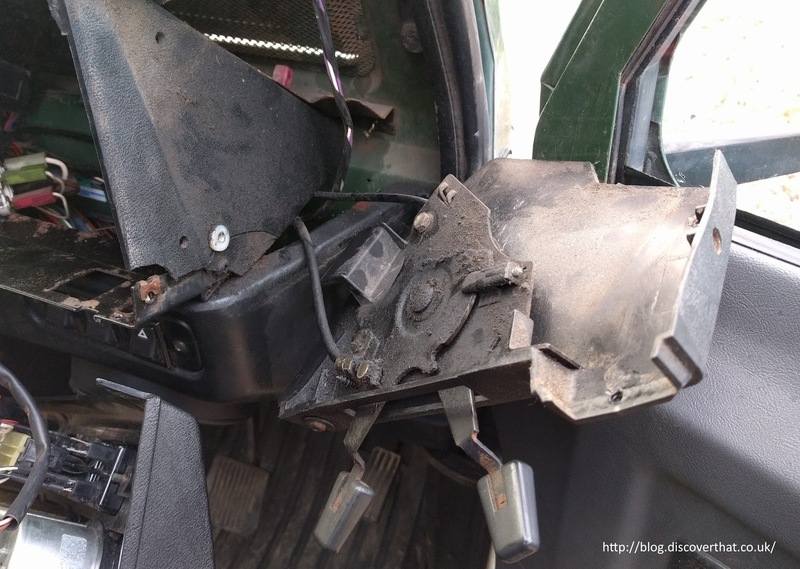 You don't need to remove the steering column plastic covers to replace the binnacle but someone had left the immobiliser coil off of the ignition barrel and I wanted to put it back where it should be. 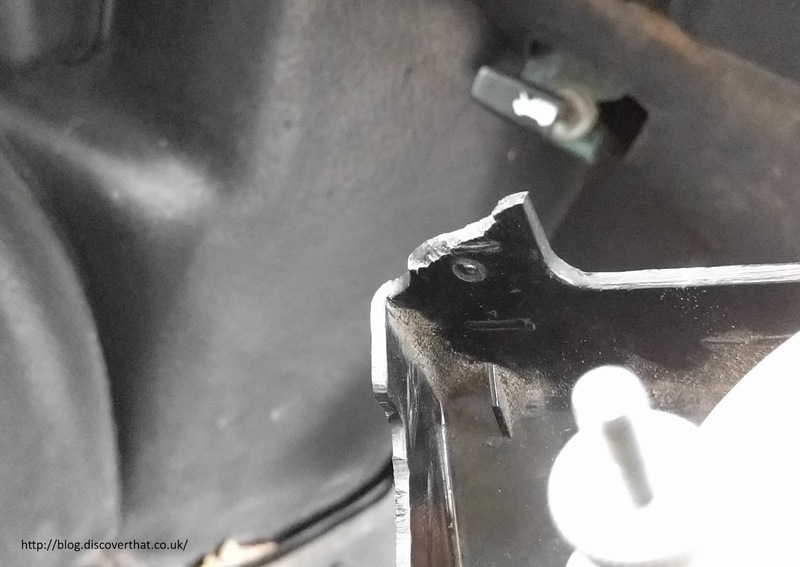 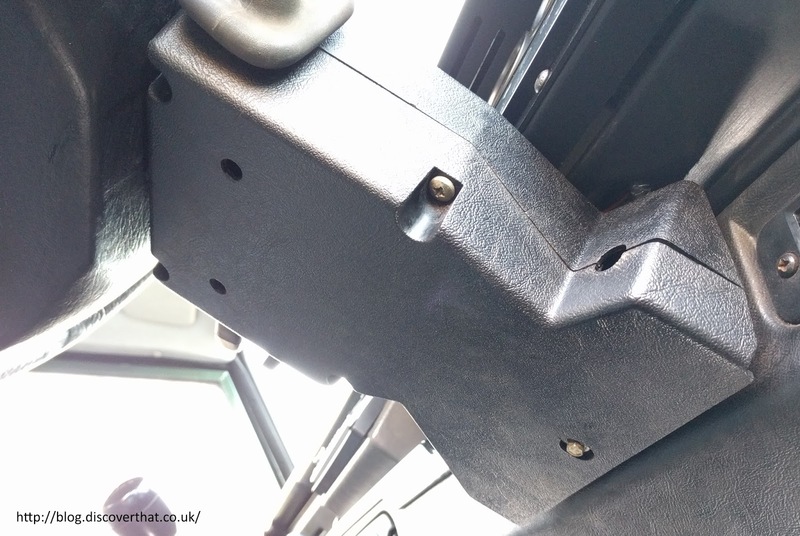 If you do take the steering column cover apart, the lower centre bolt is critical for aligning the plastic case. 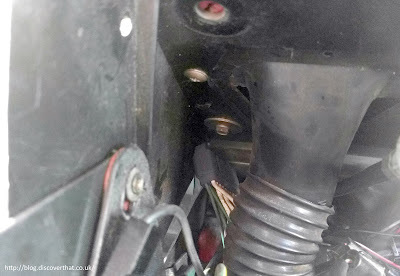 The steering column plastic cover has to go on before putting the binnacle back. 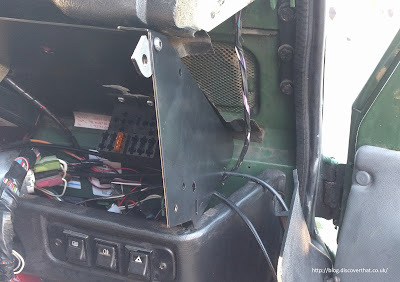 Swapping the instruments over is easy although it is necessary to drill the hole for the alarm light. I was pleased I had bought a set of new gaskets for the instruments because several of the originals had perished. The last finishing touches are the stickers for the heater controls.